Thrissur, 8 April, 2016: The renowned Kodungallur Aswathi Kaavutheendal of Kodungallur Bhagawati temple will be held today. Several devotees is being arriving at the temple for the yearly Bharani festival, an age old tradition dating back to more than hundred years. 'Kavu Theendal', involves Vellichapads (oracles) make a run around the temple waving their sabres in the air while the members of their retinue offer reverence over the inner quadrangle. They make cry of abuse at the goddess in bawdy language. 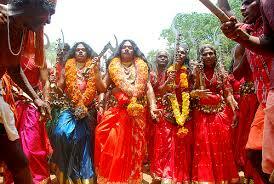 Their abuse is said to be accepted by the goddess followed by the purification ceremony the next day.